Pholiota was built as the home of architects Walter and Marion Griffin in 1920 on an allotment in the Glenard Estate, Eaglemont, which had been laid out by Griffin in 1915. Built using Knitlock concrete blocks, the small house was designed with a highly innovative plan. Subsequent additions, particularly in 1938, have concealed the original building from the street, however the original dwelling can still be recognised. Arriving in Australia permanently in 1914, American architects, Walter Burley Griffin (1876-1937)and Marion Mahony (1871-1961)moved to Melbourne in 1915. In 1919 their first experiment with minimalist dwelling design was a pair of cottages, Gumnuts and Marnham, Frankston, designed for their use as a weekend retreat. These prototype Knitlock cottages employed a construction system of concrete wall tile units that Griffin had patented in 1917. This system was developed as an economical, flexible and quick do-it-yourself construction system, with machine produced standard concrete tiles, or segments, which were fitted together on site. Machines and timber moulds were used to cast the concrete tiles, which were basically of two types; the vertebral, quadrant shaped block, that formed the framework and the distinctive vertical piers; and the tesseral block that provided the wall infill. The former blocks formed columns and corners and the latter were interlocked back to back with staggered joints, resulting in smooth surfaces both externally and internally, and the facility to incorporate steel reinforcing rods in the core between blocks. The Griffins utilised the same Knitlock construction system in the design of their first home, Pholiota, on land they owned on the Glenard Estate, adjacent to that of architect, Roy Lippincott and his wife, Walter's sister. A very small house of innovative design and novel construction system, Pholiota was controversial in terms of building regulations at the time of construction. Pholiota is a small, single storeyed house with square plan, laid out using modules, defined by the vertical piers of the Knitlock system, and an overall dimension of 21 feet (6.4 metres). It was designed as a cross within a square, containing a central, square room with a pyramidal ceiling, surrounded by a series of eight small alcoves with flat ceilings. These alcoves originally contained the entrance and service areas in the corners and a piano, fireplace and two bedroom alcoves on the sides. Curtains were used to partition the corner alcoves, and bedroom spaces when required. Casement windows, with decorative diagonal glazing bars, extend to the ceiling line, and were designed to open inwards using a simple nail pivot. The floor was originally of red brick laid directly on the ground using a herringbone pattern, and this is evident in the former kitchen and bathroom areas. The roof was clad in terracotta tiles, rather than matching Knitlock roof tiles as used at Gumnuts and Marnham, patented in 1918. Pholiota was sold in 1925 after Walter left Melbourne to join his wife in Sydney and the house then had a series of owners. In 1938 extensive additions were made along its eastern frontage, doubling the size of the house and obscuring it from the street. The original kitchen and bathroom were removed at this stage. Pholiota was again extended in 1975 with the addition of a brick wing along the southern boundary and a second storey was added to part of this in the 1990s. As a result only the western elevation of the original building remains entirely unobstructed. Much of the original fabric and finishes of the interior have been altered, including the floor and ceiling, however the Knitlock wall tiles are still evident on all sides of the room. Pholiota, Eaglemont is of architectural, historical and scientific (technical) significance to the State of Victoria. Pholiota is of architectural significance as a rare surviving example of the minimalist house planning developed by Griffin. Its internal planning, with central open plan living space and surrounding alcoves, was a highly distinctive example of a one roomed house; one of only three realised by Griffin. The others were adjacent cottages in Frankston, Gumnuts (VHR H1328) and Markham (demolished 1983). 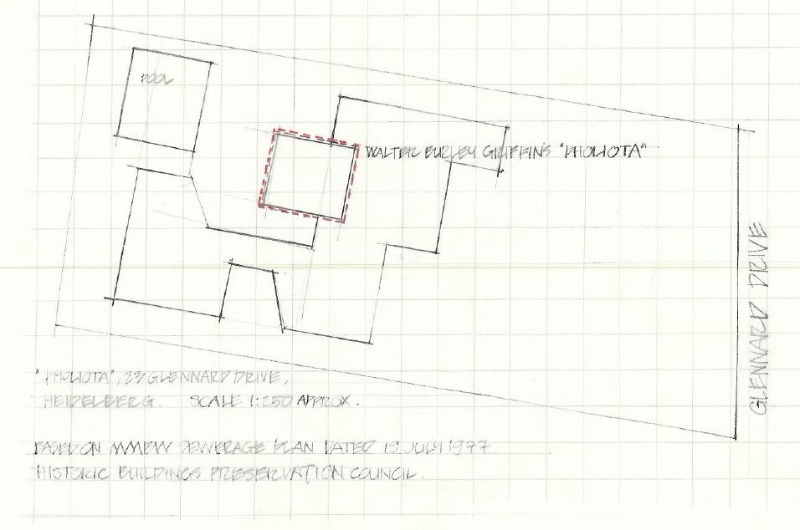 Although altered, the original plan form at Photiota can still be seen. 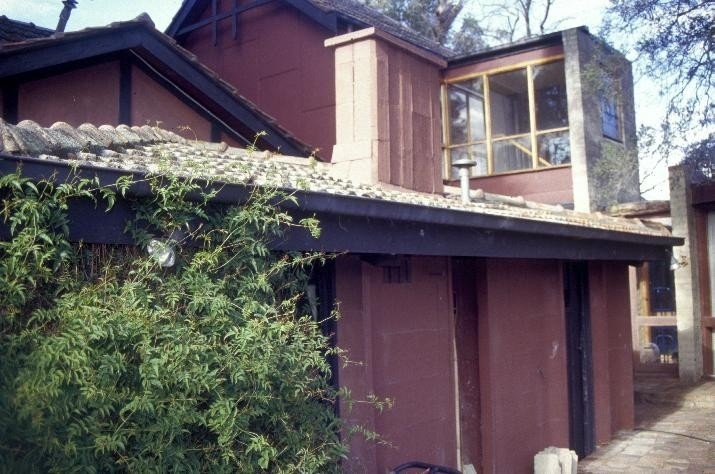 Pholiota, Eaglemont is of historical significance for its association with internationally renowned American architects, Walter and Marion Griffin. Located in one of Walter's own subdivisions, it is important as a rare example of a house the Griffin's designed for their own use. Marion's high regard for Pholiota is evident in her memoirs, where she refers to it as 'one of the most perfect buildings ever built'. Pholiota, Eaglemont is of scientific (technical) significance as an example of the use of the innovative Knitlock system. Few Knitlock buildings were constructed and fewer remain extant, and Pholiota is one of a small number that survive in Victoria designed by Griffin. Although in an altered state, the original construction is still evident. Other surviving examples include the earliest known example, Gumnuts, Frankston, 1919 (VHR H1328) and the Jefferies House, Surrey Hills, 1924 (VHR H0461). Historic Building No. 479: 'Pholiota', 23 Glennard Drive, Eaglemont. Arriving in Australia permanently in 1914, American architects, Walter Burley Griffin (1876-1937) and Marion Mahony (1871-1961) moved to Melbourne in 1915. In 1919 their first experiment with minimalist dwelling design was a pair of cottages, Gumnuts and Marnham, Frankston, designed for their use as a weekend retreat. These prototype Knitlock cottages employed a construction system of concrete wall tile units that Griffin had patented in 1917. This system was developed as an economical, flexible and quick do-it-yourself construction system, with machine produced standard concrete tiles, or segments, which were fitted together on site. Machines and timber moulds were used to cast the concrete tiles, which were basically of two types; the vertebral, quadrant shaped block, that formed the framework and the distinctive vertical piers; and the tesseral block that provided the wall infill. The former blocks formed columns and corners and the latter were interlocked back to back with staggered joints, resulting in smooth surfaces both externally and internally, and the facility to incorporate steel reinforcing rods in the core between blocks.